advice - used scope on CL - what is it? C10N? I found this on local craigs list, says its a "C10" but obviously its a newt right? C10N? I don't know what the mount it tho, looks like the AVX I have but with some minor differences. did some google work and I think its a C10-NGT. Do you guys know what this setup is? Also its $560 was $700 2 weeks ago. I'm thinking of getting it, but have seen a lot of mixed reviews on the C10N-GT if thats what it is. I'd like to get it for visual and EAA live stacking. It looks like a C10-N GT to me, That's the 10 inch F/4.7 Synta OTA on the CG-5 ASGT mount. The CG-5 ASGT was the predecessor to the AVX. I had a CG-5 ASGT that I used with a 8 inch F/5 Newtonian, I bought the rings to mount my 10 inch F/5 Dob OTA on the CG-5 ASGT.. I mounted it but I never used it, the 10 inch OTA was clearly far too much for the mount. 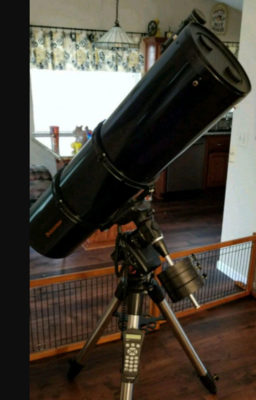 In terms of purchasing it, my first inclination was so say that while the scope and the mount are a bad match, for $560, the mount and the OTA are worth that much or more. But I then thought, I don't think I want to buy an CG-5 ASGT that had been used with a 10 inch Newtonian.. It's overloaded. Of course this does not address the variety of issues observing with a 48 inch long 10 inch Newtonian on a GEM. GEMs were they way they did things in the 1970s when a 6 inch was a big scope and a 12.5 inch was an observatory scope. One difficulty with a Newtonian on a GEM is that the eyepiece/focuser rotate as you move about the sky. The eyepiece can be in some very awkward locations making it difficult to view. Even when the eyepiece is in the optimal position, it can be awkward. The solution is to rotate the OTA. You loosen the rings and rotate the scope. It is difficult to do without the scope slipping, without the clutches slipping and having to realign the GOTO. And just rotating the tube, because of the alignment of the scope relative to the mount, can result in a misaligned GOTO. One can buy or fabricate rotating rings that allow for the rotation of the scope without slipping but the alignment issues still remain. Today, a 10 inch Newtonian is considered a easy to manage, easy to setup and transport scope. A 10 inch Newtonian can be very comfortable scope, easy to use. But that's a Dobsonian mount, not a GEM. It's often suggested that the "Dobsonian revolution" was about cheap aperture but that is only half the story. An inexpensive scope that is difficult to use will never get used. The Dobsonian revolutionized larger aperture Newtonians because it transformed the ergonomics, the viewing comfort, the actual using experience is so superior to a Newtonian on a GEM.